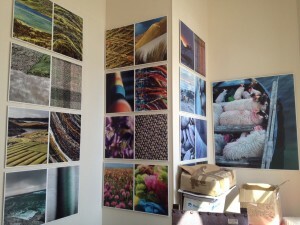 ← What’s in the Harris Tweed Authority archive? 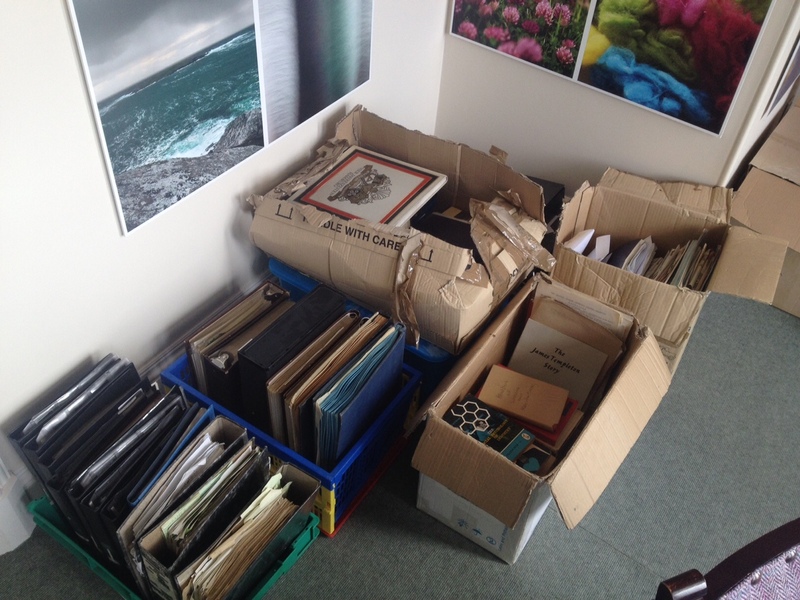 As mentioned in a previous post, the majority of the Harris Tweed Authority (HTA) archive material was transferred to Tasglann nan Eilean in 2012. However, there is still some material of interest at the HTA offices, and two weeks ago I spent some time there having a look at it. The HTA offices are located in Stornoway Town Hall, a beautiful building which also houses Stornoway Historical Society and a number of council (Comhairle nan Eilean Siar) services, as well as being used for public events. As you might expect, they’re full of Harris Tweed furniture, and newly decorated with colourful images from photographer Ian Lawson’s book From the Land Comes the Cloth. I found that the material still being stored with the HTA tended to be more promotional in nature, and therefore more visually exciting, than a lot of the legal and brand protection paperwork that has already been transferred to the Tasglann. There were even modern Harris Tweed samples, such as the cloth produced for the 2014 Commonwealth Games. There are a wide variety of photos, many of which are in the form of transparencies – photographic images on film that can be viewed when held up to the light. Though undated, a lot of these feature fashion shoots of models wearing Harris Tweed clothing, with distinctly 80s and 90s appearances! There are also images of mills and weavers, whom it would be good to be able to identify in the course of the cataloguing project. 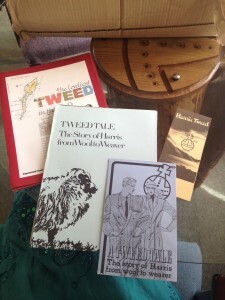 In terms of complete advertising or promotional material, there are items originating from the HTA themselves, as well as leaflets and brochures generated by producers of Harris Tweed clothing and other products. There are a number of free-standing brightly coloured HTA signs that could have been used in premises selling Harris Tweed products. Other items are more informative, such as leaflets explaining the origins of Harris Tweed, or showing examples of designs for garments made from the cloth. A different type of promotion took the form of a competition, with fairly generous terms – a Harris Tweed cap was awarded to the writers of the five best Harris Tweed-based limericks each month! The many folders of press cuttings at the HTA demonstrate what a popular subject Harris Tweed – the cloth and the industry in general – has long been with the wider public. These folders exist from the 1970s up to the late 2000s, but have now given way to the inevitable sea of online articles. More evidence of the popularity of Harris Tweed as a subject comes from the examples of college and university work I found; for instance a project titled Wool and Weaving, including stuck-in pieces of real wool! Older material includes a list of weavers organised by township, originally written in the 1930s, but updated in the 1950s. 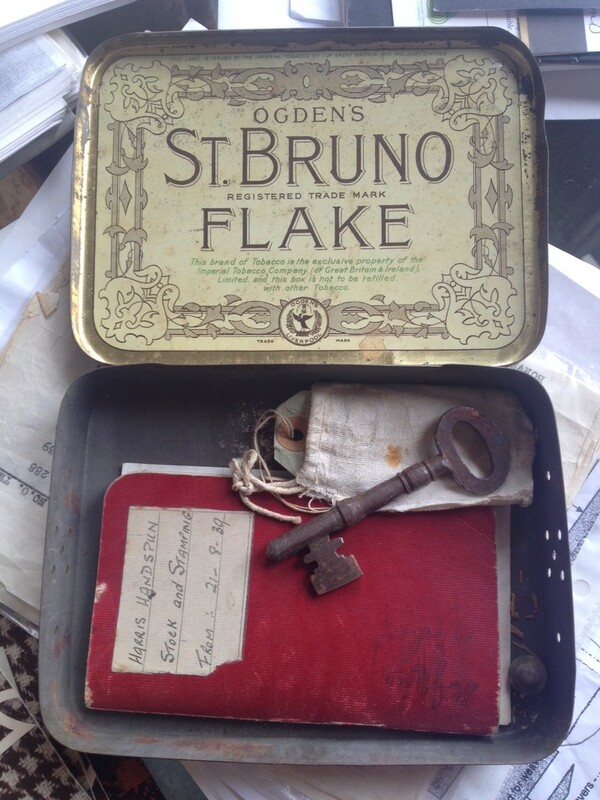 The most mysterious find is also one of the oldest – a tobacco tin containing a large metal key, along with a notebook recording the stamping of handspun Harris Tweed between 1939 and 1945. Who knows if the lock that fits this key still exists?! Much of the material mentioned above will be transferred to the Tasglann in the next few months to join the many boxes of papers already here, and be incorporated into the collection – by the end of the year it should be searchable in an online catalogue. This entry was posted in Harris Tweed cataloguing project and tagged advertising, Harris Tweed, Harris Tweed Association, Harris Tweed Authority, key, leaflets, photographs, press cuttings. Bookmark the permalink.